The school aims to create an atmosphere and learning environment where all are given equal opportunity to develop their skills and abilities in all aspects of life to their full potential. In school we believe that we should 'counsel and contract' pupils into better behaviour rather than the more traditional approach of 'reject and punish'. We want to catch pupils doing well and praise them for it. 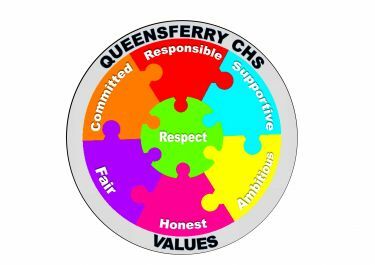 We also want to promote positive, respectful relationships between pupils and between staff and pupils in school. When things go wrong we try to restore relationships so that learning can continue. Poor behaviour or poor choices by young people, however, cannot be inconsequential and a range of staged interventions may be applied as described in our 'staged intervention and behaviour management' policy. We always strive to ensure that we provide the best possible support for your child - in every way that we can. If you are dissatisfied with any aspect of QCHS or any area of your child's education, the first point of contact is the School itself. See 'contact us' for details. If you are still not happy with the outcome, City of Edinburgh Council operates a set complaints procedure which are found on our 'advice on making a complaint' page.